Kingsley CEO Daya Thayan said: “We are proud to have partnered for the first time with Deeley Construction in building this state-of-the-art home in our 20th anniversary year. We look forward to continuing the partnership on future projects. 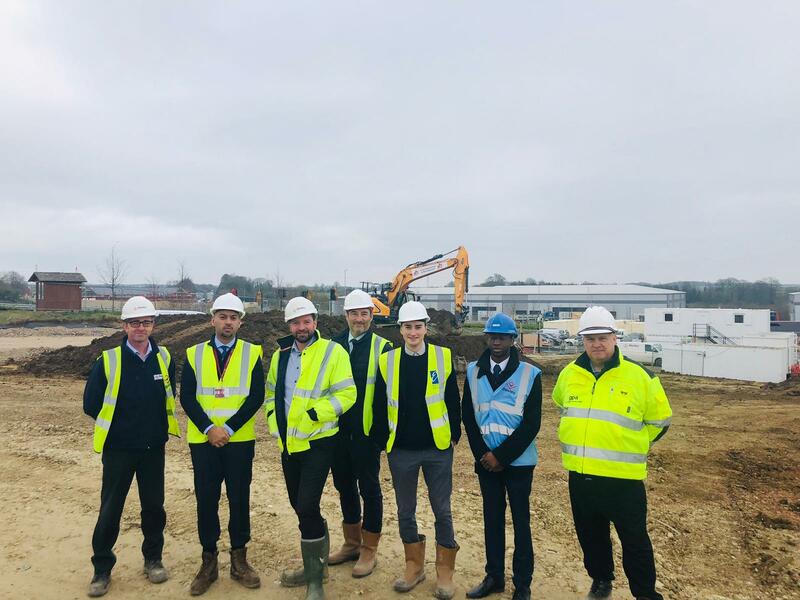 Work is underway on the next stage in the development of Maybrook Retail Park in Stratford-upon-Avon. 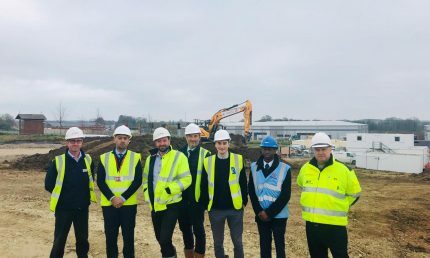 Deeley Construction has started work on the fit-out scheme of the new Lidl store at the retail park which is located one mile from Stratford’s town centre. The firm tendered directly to the supermarket giant to secure the £1 million project and completion of the fit-out of the 21,965 sq. ft. unit is targeted for May this year. The project comes following the Deeley Construction’s completion of an extension to Unit 1 of the existing retail building development. Work began on the £2.4 million extension and refurbishment project on behalf of BMW (UK) Trustees Limited in June 2018 and was completed in February. 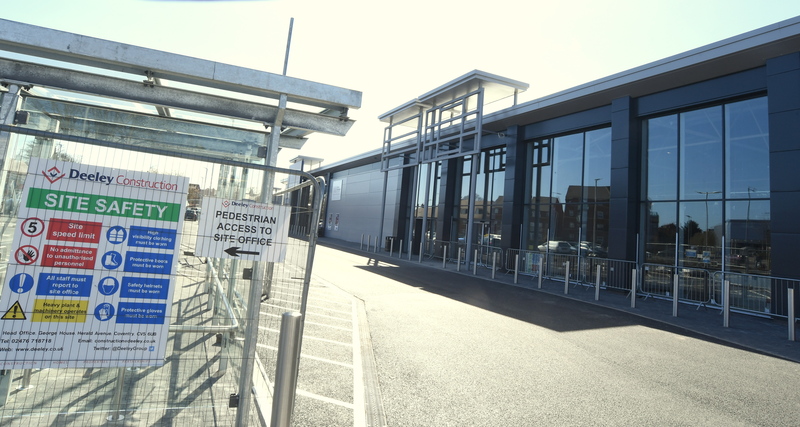 It incorporated over cladding of the large steel frame unit, new shop frontages and entrances to Units 2 and 3 at the retail park. Martin Gallagher, Managing Director of Deeley Construction, said: “We are delighted to have secured the project to fit-out the new Lidl store at Maybrook Retail Park and continue our development of the site. “To have won this contract is testament to the fantastic work our team did on site in completing the initial extension. The roof of Woodside Care Village on Spinney Hill is now complete and internal work has recently started at the deluxe village-style experience for 72 residents including older people and people with dementia, which will open in Autumn 2019. It will feature family-scale households for six or seven people with ensuite bedrooms for everyone, as well as a spa, salon, cinema, and café plus table tennis and a side-by-side bike-for-two, complete with a cycle track – all designed to ensure the people who live there enjoy life as much as possible. 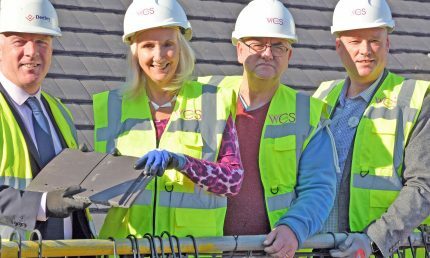 The state-of-the-art home has been designed for Warwickshire-based charity WCS Care by local architects Robothams and will encourage people to spend more time outdoors, which has benefits to health and wellbeing. Built by Coventry-based Deeley Construction, Woodside Care Village will feature the latest technology that will enhance and integrate into daily life without being intrusive. Smart phone apps connected to mobile care monitoring will mean carers spend more time with residents. It’s linked to a Relative’s Gateway, where people can check and interact with their loved ones’ care 24-hours a day, wherever they are with an internet connection. 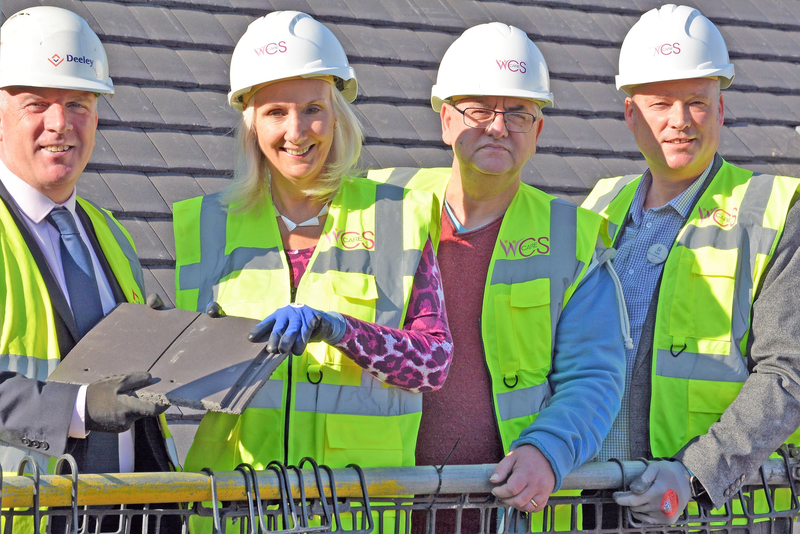 A ‘topping-out’ ceremony was held this week (Tuesday 26 February 2019) to mark the three-story home reaching its highest point. Christine Asbury, WCS Care’s Chief Executive, said: ‘In all WCS Care homes, our ambition is that every day is well lived for our residents – that means we provide plenty of opportunities for people to try something new and enjoy what they’ve always done. ‘We’re really excited because we’re creating a home at Woodside Care Village that’s designed specifically to deliver this ambition for the people who will live there. To find out more about WCS Care, visit www.wcs-care.co.uk, find us on Facebook at www.facebook.com/wcscare or add us on Twitter by searching @WCS_Care. A Leamington development has been recognised with a double nomination at a prestigious industry awards. Union Park has been shortlisted in the Regeneration and Residential categories at the RICS (Royal Institution of Chartered Surveyors) Awards 2019 for the West Midlands. 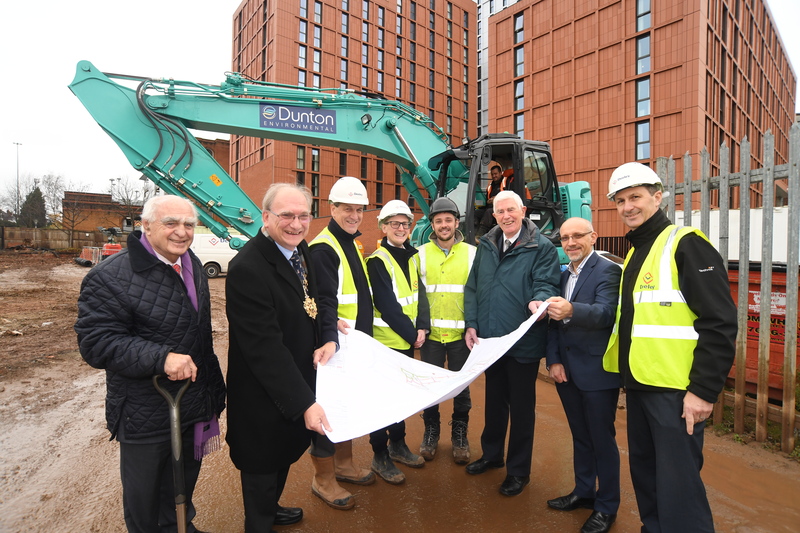 The £29 million development comprises of 147 affordable homes on the former Soans’ motor dealership site in Sydenham – developed by Deeley Group on behalf of Orbit Homes. The shortlist recognises the 25 of the region’s most innovative and community beneficial property projects – with the winners to be announced at the awards ceremony at Birmingham Botanical Gardens on Wednesday, May 8. Regional winners will then go on to the RICS Awards Grand Final in November, as the overall UK winner in each category is decided. All regional winners go on to compete against other regional winners at the national RICS Awards Grand Final in November 2019, for the chance to be crowned the overall UK winner in their respective category. Stratford-upon-Avon’s Fordham House – also built by Deeley – has also been nominated in the Residential category. The project comprises 82 high-quality apartments and was developed by Orbit Homes in partnership with Deeley Construction and ABD Developments. 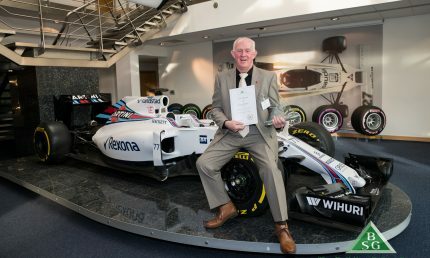 Peter Deeley, Managing Director of the Deeley Group, said: “It is fantastic news to have projects shortlisted in not one, but two categories at these prestigious industry awards. “The RICS Awards are a wonderful showcase of projects across the West Midlands and the strength of industry in the region is reflected in the projects shortlisted. Bryony Martin, Chair of the RICS Awards 2019, West Midlands judging panel, Director of Cost Management at AECOM said: “This years’ shortlisted projects have made real impact on local communities: attracting more visitors and inward investment, providing much needed housing or delivering vital services and infrastructure. Work is underway on a new look home for the Coventry branch of Samaritans in Earlsdon. The charity’s shop and call centre is undergoing major repair and renovation to improve the facility for its volunteers. The renovations will see a complete refurbishment of the facility, including improved access for disabled volunteers, more storage for the shop and enhanced acoustics to assist in secure, sensitive conversations. Deeley Construction is carrying out the works at the building on Moor Street, which is Earlsdon’s oldest shop and first opened in the 1860s as a provisions merchant. The construction company has brought in architects IDP to manage the project on behalf of the Samaritans, and worked to establish a relationship with the 29th May Charitable Trust to provide grant support. Other contractors assisting on the project include Umberslade Demolition, Claddagh Electrical, CDE Contractors, Naughton Interiors, D B Heating & Plumbing, Nationwide Windows, Midlands Flooring, Cladding Components, Midlands Floor Screeding and G&M Carpentry. 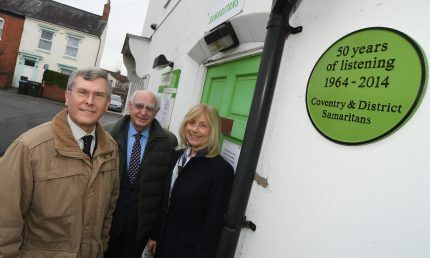 Coventry & District Samaritans were contacted more than 33,000 times in 2017 and are open 138 hours a week – assisted by its 120 strong group of volunteers. The shop, which can raise up to £500 per week for the charity, is expected to re-open in April but the charity is still maintaining a full call service from a temporary base at Coventry Resource Centre for the Blind. Mike Ballinger, project manager at the Coventry & District Samaritans, said: “Our volunteers are invaluable to us and without them we wouldn’t be able to provide the service we do. “We wanted to make life easier for them and these renovations will help to do that, particularly by improving accessibility. “The stairs inside are quite steep, and some of our volunteers find difficulty going up and down them at the moment. We will be lowering the stairs and also improving side access for volunteers in wheelchairs. “The shop itself will be renovated too. Our shop volunteers are vital and with their fundraising allow the charity to focus on its core purpose of helping people by phone, text and e-mail. 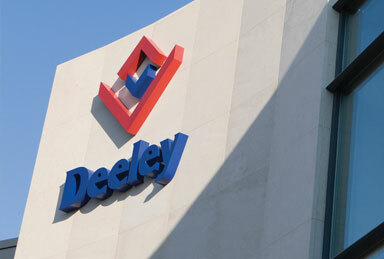 “Deeley Construction have been very helpful in the process. 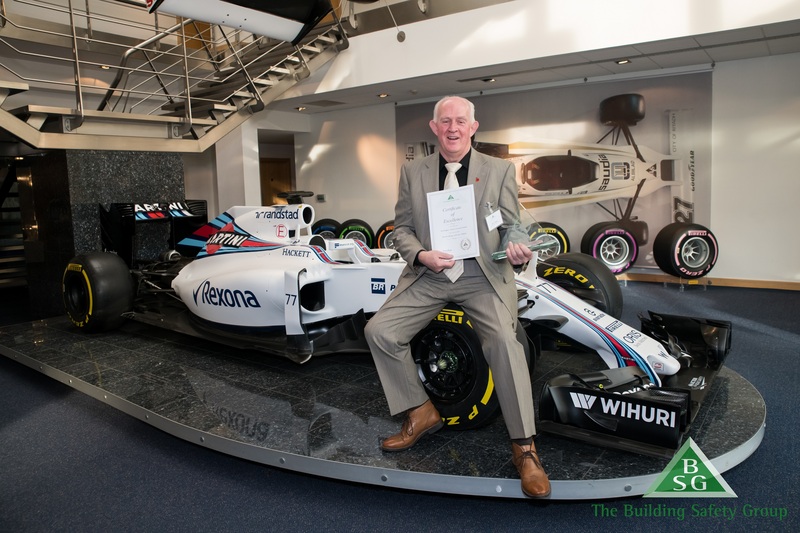 It is a very professional organisation and it’s great to know that our building is in safe hands. 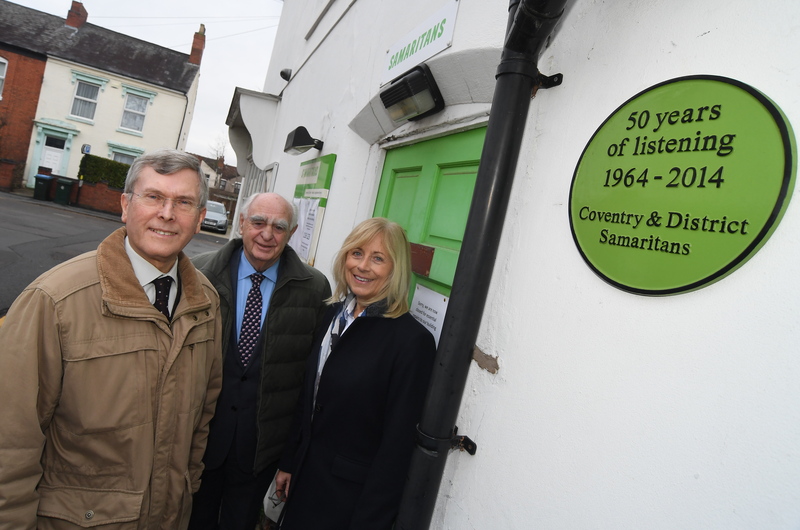 Peter Deeley, managing director of the Deeley Group, said: “The Coventry & District Samaritans provide an important service in the city and surrounding area. “By working closely with our local supply chain we’re delivering this charitable scheme at an affordable cost to ensuring the Samaritans get as much help as possible from the funds available. 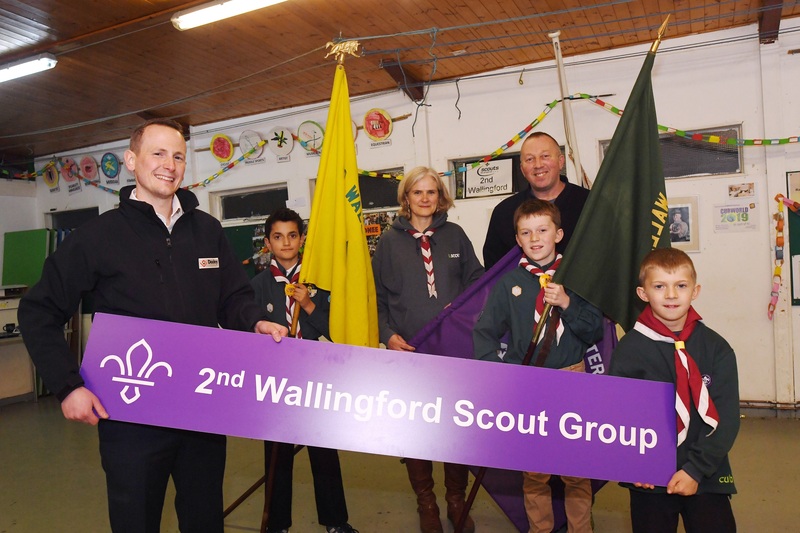 The 2nd Wallingford Scout Group has received a boost from Deeley Construction to help with future fundraising activities. Deeley Construction has donated a barbecue, new sign and arranged for a free skip to help the scout group’s clear out of its storage hut. The Coventry company has recently built the new Lidl store in the town which will open at the end of January. 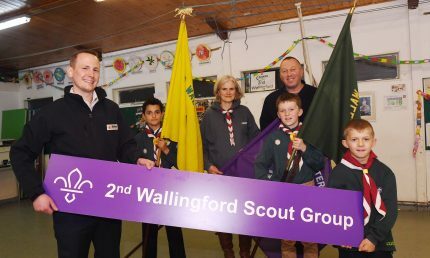 2nd Wallingford Scout Group has more than 120 members – boys and girls – across Beavers, Cubs and Scouts who are supported by more that 30 Leaders, Young Leaders and Trustees. The new sign has now been placed on the front of the group’s main scout hut, while the donated barbecue will be the centrepiece of fundraising events throughout the year. Helen Liddar, Group Scout Leader of the 2nd Wallingford Scout Group, said: “It was a completely unexpected donation and we would like to thank everyone at the Deeley Group for the very generous gifts. “The skip was actually really vital for us. We have two huts, but one is primarily used for storage. Having the skip available helped us to clear-out and re-organise our storage areas which helps support our amazing adult leaders to deliver camps and other fun activities for our young people. The free skip was supplied by Aylesbury-based waste management service business Bucks Recycling. Tricia Murray, Managing Director at Bucks Recycling, said: “Bucks Recycling has provided a waste management service for the Deeley Group for many years so when they asked for our help, we were very happy to donate. “Our Operations Manager is a Scout Leader and devotes much of his spare time to taking scouts on field trips and great learning adventures. “He believes that being a Scout teaches life skills and develops confidence in a way that schools are not equipped to do due to the constraints of the national curriculum. Edward Hudson, Business Development Manager at Deeley Construction, added: “The scout group is only a 10 minute walk from the new Lidl store and is an important project in the local community. A Coventry company has started work on the final piece in its Belgrade Plaza jigsaw – 12 years on from its first development in the area. Deeley Construction has been appointed to complete a new £6.8 million development on Bond Street in Coventry City Centre. The project, which will be known as Bond’s Lodge, has broken ground and is expected to be completed by April 2020. Coventry Church (Municipal) Charities has appointed Deeley Construction to carry out the project, which has been designed by Nicol Thomas Architects. The completed scheme will see a three-storey building erected, featuring 45 self-contained apartments for the elderly. It marks the company’s first project awarded from Homes England’s DPP3 Framework. It is being funded from the Coventry Church (Municipal) Charities’ own resources, fundraising, together with a grant from Homes England and a loan from the Charity Bank. The Almshouses, now run by Coventry Church (Municipal) Charities, were founded in the early 1500s and today are both sheltered housing schemes for elderly citizens in the city. Since the Second World War, the charity has engaged in two major projects in Hill Street, the building of Bond’s Court in 1985 and the extension of Bond’s Hospital in 2004. With the completion of Bond’s Lodge, the number of residents will have risen from 22 in 1509 to more than 150 in 2020. Victor Keene MBE, Chairman of Coventry Church (Municipal) Charities, added: “We have acquired the long lease of a site opposite Bond’s Hospital Almshouse, which will see 45 apartments built for the elderly. “We have engaged Deeley Construction as the building contractor on this project and are very happy to be working with a company of Deeley’s integrity to complete it. The project is the third development carried out by Deeley in the area, with the nearby multi-storey car park completed 12 years ago and the Belgrade Plaza development in 2008. Belgrade Plaza is now a thriving mixed-use scheme, home to restaurants, residential and fitness facilities – serving the community in Coventry city centre. Peter Deeley, Managing Director of the Deeley Group, said: “The ground-breaking at Bond Street marks an important milestone in the company’s development of the area. 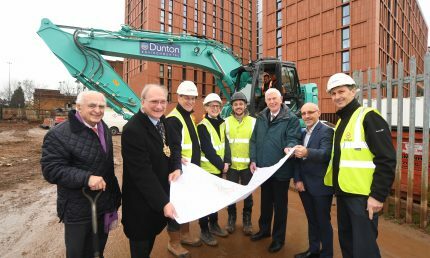 “The apartments created in this development will be a vital resource for elderly people who are looking to live in the city centre. Councillor John Blundell, Lord Mayor of Coventry, added: “There is a clear need for more accommodation of this type in our city centre and the development on Bond Street will help to cater for this need. “Coventry Church (Municipal) Charities have done some excellent work in regenerating properties across the city, including the Bond’s Hospital, and providing homes for the elderly. PICTURE CAPTION: From left to right – Peter Deeley (Deeley Group), Cllr John Blundell Lord Mayor of Coventry, Richard Hammond (Deeley Group) , Edward Hudson (Deeley Group), Marc Neville (Deeley Group), Victor Keene MBE (Coventry Church Municipal Charities), Simon Peplow (Nicol Thomas Architects) and Nick Southern (Deeley Group).